I don't get a whole chicken, sliced into small pieces at the grocery store, and I don't know how to cut a whole chicken on my own, which means thighs and drumsticks are what I use in curries and bakes. Its so damn boring to eat it again and again and it doesn't even taste that great. They are huge, chunky pieces and I hate the very look of it. So instead of those I used chicken wings for the preparation and I am so so so glad I did, it turned out perfect. Juicy and moist and no hassle of cleaning and cutting (we get skinless wings here, all cleaned and ready to use). I bought it yesterday, marinated it and was getting ready to grill it when the hubster called from work saying he was in the mood for Chinese and to be ready by the time he gets home, so we could head out to our fav Chinese restaurant round the corner. I was back late after my swimming session and was in absolutely no mood to cook and had to drag myself off the couch to marinate the chicken. And then when I get all enthu about the outcome, there, I was asked to leave everything and get ready for Chinese grub. If it was any other day I would have said yes to it before thinking twice, this time however, I didn't want to go out. But Ro convinced me to refrigerate it and use it the next day, in which case the marinade would have caught on better. Now I hate to admit it, but that was such a fabulous idea. It was perfect when I grilled it today. 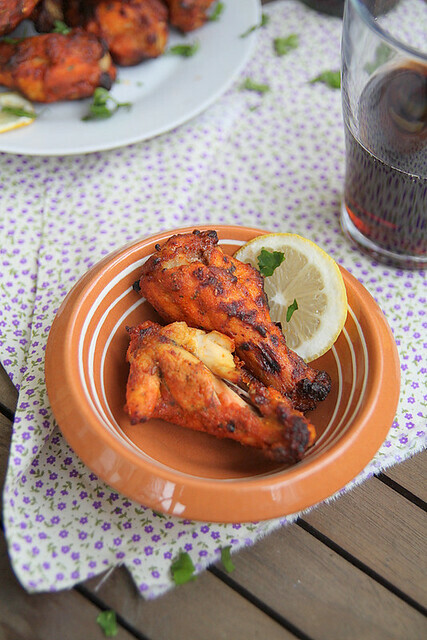 This recipe is very similar to the Grilled chicken wings- Indian style but without the sauce and such, but taste-wise it was a while lot different, somehow. I hadn't planned on taking pics and blogging it, but it was too good to pass and in spite of it being a gloomy and foggy day, I stepped out on to my balcony, arranged everything and was getting ready to click away when the cleaning lady who was raking leaves called out, 'isnt it a bit too cold for a meal outside love' and I was embarrassed. I was shivering in my shorts and jumper and how on earth would I explain to her I was taking pics for my blog, and about lighting issues. I just shrugged and said I wanted to take a couple of pics and she went back to her job with a quizzical expression on her face. So I couldn't take too many pics, one because it was biting cold and two, the moms going to pick the kids up from the school behind my apt all started staring at this wacko woman in shorts, taking pics of food outside on her balcony. Wash and clean the chicken wings and place in a large bowl. Whisk together all the remaining ingredients and give a quick taste test to see if there is enough salt and spice and adjust accordingly. Pour over the chicken wings and toss it well it the marinade, making sure all the wings are evenly coated. Cover using a cling film, or place in an air tight container to marinate over night in the refrigerator. If you are time constrained then a couple of hours should do. 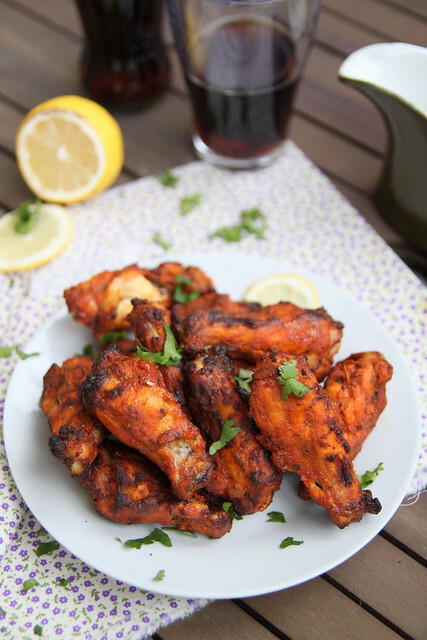 When ready to grill, arrange the wings on a baking tray lined with aluminium foil. Retain the leftover marinade. Preheat the grill/ broiler and place the tray on the middle rack and cook on one side for 7 minutes. Remove, flip it over and grill for another 7 minutes. Take it out and brush the wings with the left over marinade. Place the tray back in and grill for a about 2 to 3 minutes, just to cook the masala. You can check if its done by inserting a knife into the fleshy part and if juices run clear, you are good to go. The wings will definitely be done in a matter of 15 minutes as your are grilling on high heat. Let it rest for a couple of minutes on your kitchen counter before serving it as a starter or with a salad as a side. Notes: Not a spicy preparation at all, so increase the chilli powder quantity as required. I also don't place the rack right below the grill, as it just chars the meat way too fast. So I keep it in the middle, but still grill on high heat, which makes for even cooking and a bit of charring as required. Looks awesome!Hey, I like the new facelift you have given to the blog!Just came home from work and decided to drop in. When taking pictures in the balcony I get the look from folks too. I just shrug and continue. But I will have to wait till next summer to step outside too. Hey, I have made this dish from scratch this summer and it was awesome.I never tried to make it from scratch cause I was happy with Shaan T.mix. But when MIL asked me to do it, I broke out from the norm and gave it a try from scratch! I used Kashmiri Chili powder for coloring and it looked and tasted awesome. What I cooked last Summer is on the queue to be posted for Day7 of BM#10 starting from tomm. :-). Stop by a week from now...to compare and contrast. what a brilliant color! and LOL about the stares while taking photographs out in the cold..i used to get a little embarassed when I started off but now Im so used to it :D I just pretend as if im doing something awesome and people just dont get it . Oh thats what I have to undergo every time. i get such looks from neighbours, my maids and passersby. the tandoori chicken looks awesome. love your presentation always. 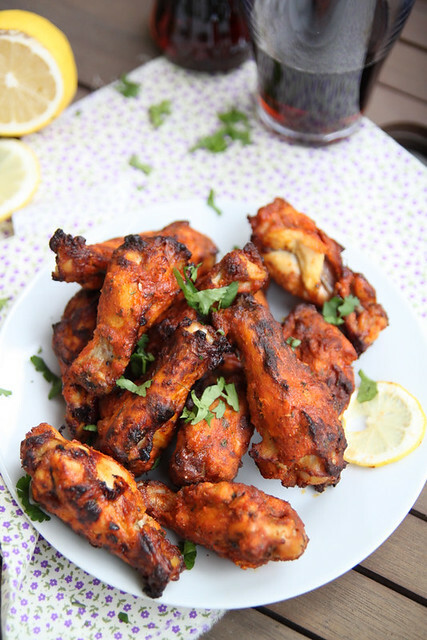 Would love to have those addictive and prefect looking delicious chicken wings..
Nice ones....my tandoori also uses almost same ingredients aprart from mustard seeds and tomato paste:)...For colour i too use paprika or kashmiri chilli powder. About ppl staring, thank god i have a back garden..its attacjed to teh next house and mostly they dont come out....Hate it when ppl stare! Dont feel comfortable at all...It sso cold these days, isnt it? 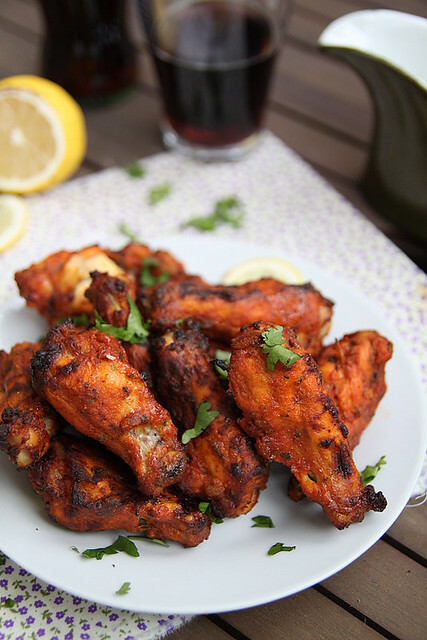 Fabulous chicken wings.. I can understand your state when people ask questions when taking pics..:) Beautifully done and presented..
Just a random visitor from Tastespotting. These look delicious and I must try them. What is the special chili powder? If you don't know how to cut up a whole chicken your best way to learn is to practise! Buy one for ten dollars and if you muck it up, it's not like the pieces need to look pretty in a curry anyways! These indeed look so good, yeah when i got married i din't know to cut a whle chicken too, i remember whne mom used to do it when i was at home i used to remark brrrrrrrr i would never do this but yeah i hd to learn it after comming here. That looks yumm Nisha. Would love to try it. I had tried grilling before but didn't turn out good. It became too dry. I liked the idea of brushing with marinade in between. Your clicks are amazing,Nisha.Love the tandoori anytime. Oh my...drooling. This looks delicious, as always, and your words make me smile, yet again. I hope you have a blessed week and a wonderful season of joy and food and fun. Awesome pics Nisha ! i used to make it all the time with store bought masala . But recently switched to homemade! luks so so yumm!! These look incredible...I've gotta try 'em! Very informative and inspiring post have been posted here. I bookmarked this blog further more information about new indian recipes.last weekend i visit a Indian restaurant for dinner. it was awesome experience of tandoori chicken taste. I never forget it's taste.I am going to cook it at home. 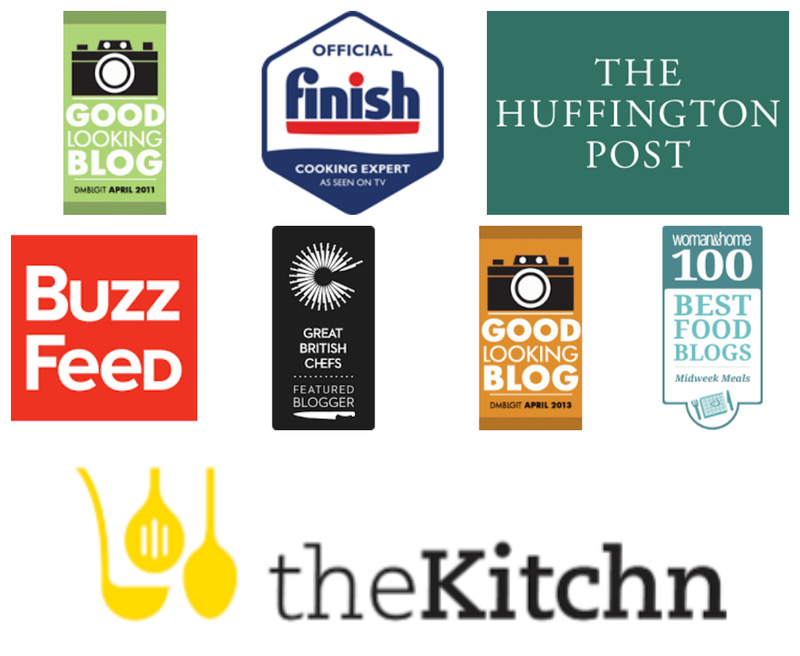 After trying our recipe please provide your feedback with good response. 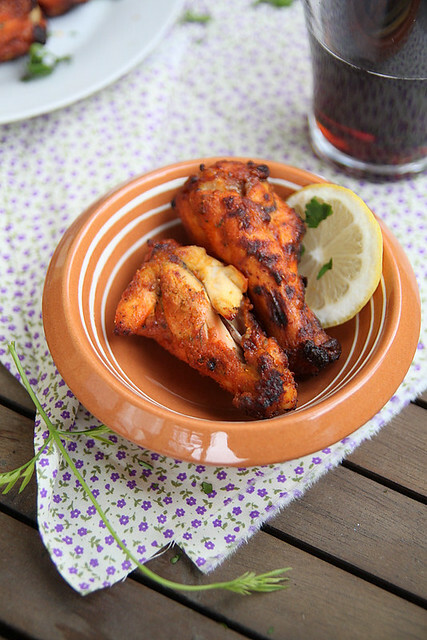 Tandoori chicken looks perfectly tasty. Mouthwatering dish, preparation method seems easy. Definitely going to try!